However, various health concerns linked to the use of genetically modified organisms (GMOs) in food production have arisen in recent years, leading to ethically questionable motives by large corporations in supplying this basic commodity to the masses. To top it all off, there are still many people going hungry around the world. Just recently, the Global Hunger Organization released its 2018 results and it does not paint a pretty picture for Southeast Asia. Given the importance of food as a necessity, countries around the globe in general and Southeast Asia in particular must adopt strategies to address such concerns. The use of blockchain technology is an example of such a strategy, allowing for the tracking of food products from an ecosystem of suppliers to store shelves and finally on to consumers. Blockchain is a distributed database that consists of blocks of data, from which it derives its name. Each block comprises a timestamped batch of validated individual transactions along with a hash of the prior block, creating a link between the two. A hash is a short value or key which represents a larger original string. Due to the fact that each timestamp includes the previous timestamp in its hash, it is then able to create a chain. Each new transaction must be authenticated across the distributed network of computers that form the blockchain before it can form the next block in the chain. According to the World Health Organisation (WHO), 10 percent of the global population falls ill with a food-borne disease each year. Most of these diseases are difficult to prevent. However, through the use of blockchain tech, the risk of contracting the aforesaid diseases can be minimised. Before food even reaches restaurant plates or grocery shelves, blockchain tech could prevent contamination from diseases spread by germs such as Escherichia coli. This system enables buyers to monitor the quality of food supplies as well as the schedule by which they are transported. From there, stakeholders in the supply chain can identify potential hazards with just a few clicks on a screen. 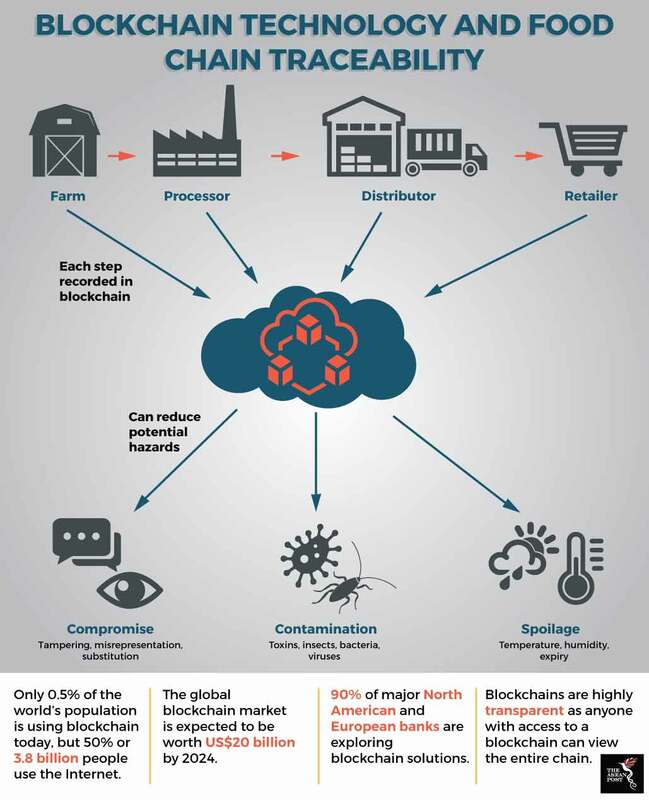 A blockchain-enabled system allows for the digital tracking of product information in a food supply chain, including farm origination details, batch numbers, factory and processing data, expiration dates and storage temperatures, as well as shipping details. The pertinent information is recorded in the blockchain at every step of the process as the commodity moves from supplier facilities to consumer purchases. Every computer in a blockchain network must verify the information of each successive individual transaction, and once a consensus is achieved, it becomes a permanent record that cannot be changed. In this way, blockchain applications ensure the accuracy of all information relating to the food supply chain stored in their networks. Rice is the staple food of Southeast Asia, with the production of this commodity a key driver of ASEAN’s economic growth. Through the use of blockchain technologies, food chain stakeholders can be compensated swiftly, from farm to plate. Farmers, in this instance rice producers, could sell more quickly and be reimbursed for their efforts, as market data will be readily available and validated. Blockchain technology could represent a viable alternative for farmers who feel obliged to rely on marketing boards to sell their commodities. Blockchain deployments could potentially prevent price coercion and retroactive payments as well. In addition, blockchain technologies could “Uberise” the agri-food industry by eliminating mediators or middlemen, besides the lowering of transaction fees. Such a step could lead to fairer pricing and even aid smaller outfits desperate to get more market attention and traction. As such, they hold potential benefits for the competitiveness, productivity, sustainability, and transparency of the agri-food industry. The difficulty however, is to create more awareness and understanding of the blockchain tech itself, especially in rural areas. Governments within the region ought to facilitate the process of skill adoption so as to help food producers learn and prosper, creating a more holistic ASEAN community along the way. Cambodia, dubbed the “New Tiger of the Asian Economy” by the Asian Development Bank (ADB), is on the right track in terms of building traction and implementing blockchain technologies within the country. This was exemplified when Phnom Penh played host to the 2018 ASEAN Global Blockchain Summit. On the whole, the use of blockchain tech in the food market has many positive effects. From reducing health concerns to economic efficiency, countries in the region stand to benefit greatly from the use of such a system in food production. With this in mind, it is clear that blockchain technologies have practical uses not limited to just the financial domain, but in other industries as well. This article was first published by The ASEAN Post on 16 May 2018 and has been updated to reflect the latest data.